Grandma Moses always made sure she had a frame ready before starting a painting because, as she pointed out, one would not buy a pig without a pen in which to keep it. 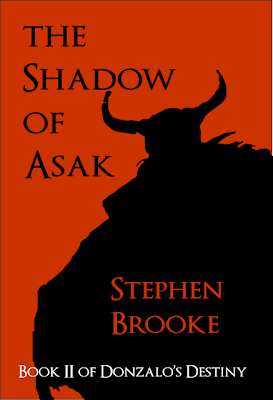 With that advice in mind, here is the ‘pen’ for my next (probably) novel, a mock-up of the cover for THE SHADOW OF ASAK, the sequel to THE SONG OF THE SWORD. The novella that will make up the first half of this book is more-or-less done, needs some fleshing out and rewriting, of course, but the story is there. Whether I’ll immediately tackle the next part, I don’t know. The plot line there is still taking shape and lacks any real climax at this point. There is sure to be fighting and love-making and dying, though. And women with swords---have to have women with swords.